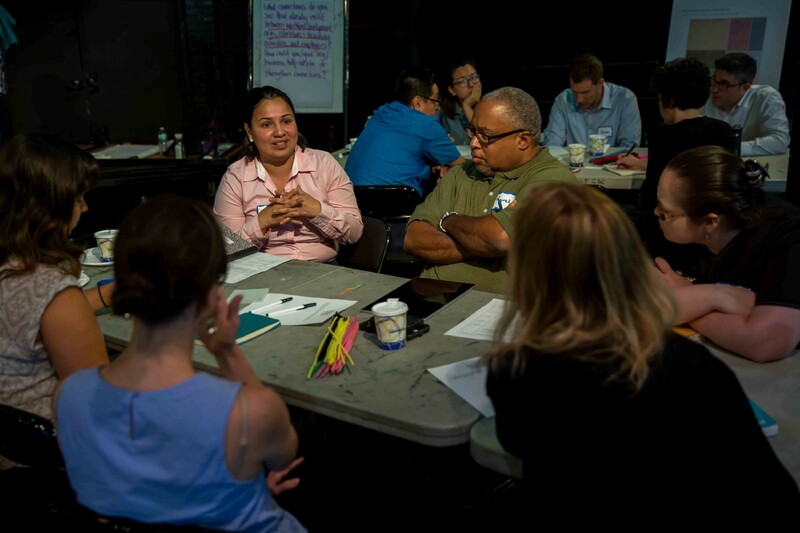 Local businesses leaders, community organizations, and City agencies came together for a day-long Hunts Point Resiliency “Collaboration Lab” on July 27. The morning’s workforce development panel included Sustainable South Bronx (SSBx), Teamsters Local 202, and the Mayor’s Office of Workforce Development. The discussion highlighted the role of businesses, the City, and workforce development organizations in building and retaining a skilled workforce. The panel highlighted programs that enable internships to grow into full-time union jobs, training curriculum developed around employer needs, and establishment of internal career pathways. Hunts Point Resiliency Artist-in-Residence Mariposa Fernandez shares her own work and poetry from the community to open the afternoon of the Collaboration Lab. 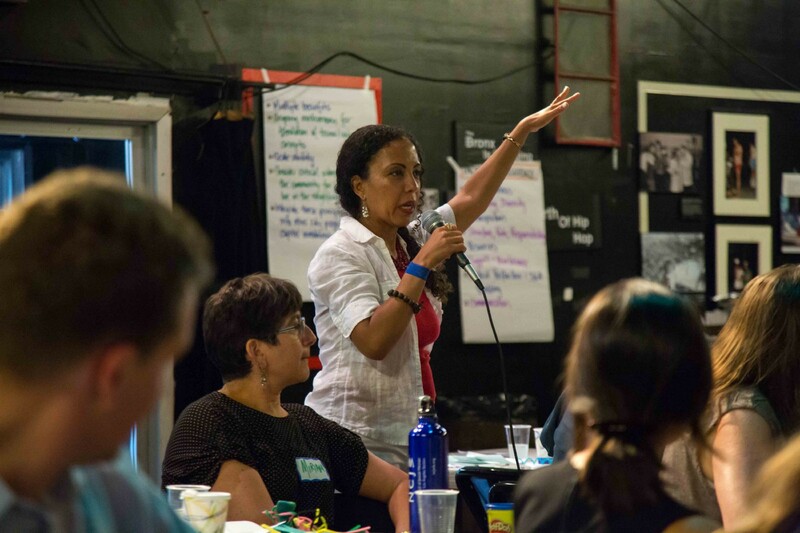 Mariposa Fernandez, one of The Point’s three artists in residence, transitioned everyone into a conversation about social resiliency with a spoken word performance highlighting art and its role in community engagement. Lilah Mejia from Good Ole Lower East Side shared lessons on how Lower Manhattan community groups came together around resiliency and emergency preparedness, providing the Hunts Point community with new ideas for advancing community resiliency. 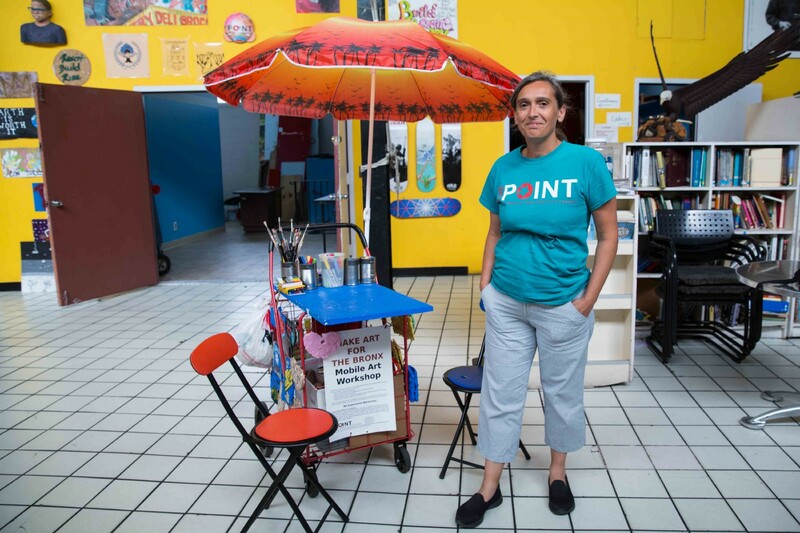 We would like to give a special shout out to Cesar [Yoc, from the Hunts Point Resiliency Neighborhood Outreach Team] for DJing the event and for the Artists in Residence, Isabelle, Mariposa, and Roy, who all brought their creative inspiration to the event! Hunts Point Resiliency Artist-in-Residence Isabelle Garbani at her mobile stand for recycled tile-making.